Olive groves are found in abundance in Provence, as the climate is similar to other growing areas around the Mediterranean (Greece, Spain, Israel, Syria, Italy etc..). Records confirm that olives have been produced in several middle east countries since prehistoric times. By 2000 BC, there are references to a form of olive press and oil exports, from what is now Syria. In ancient Greece, there are indications of the oil being used as both a food, and for grooming purposes. The olive leaf throughout history, has symbolized abundance, glory and at times peace. Through the ages the oil, has been considered sacred, it was used to anoint royalty, bless athletes in ancient Greece, fuel the eternal flame in the original Olympic games and even found in Tutankhamen’s tomb. 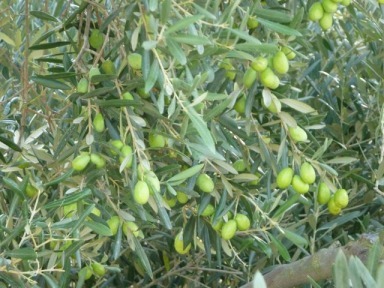 Today, olive cultivation and associated production is very important to the Mediterranean economy. Spain is the largest producer in the world at 36%, followed by Italy at roughly 25% and Greece at 18%. Worldwide production in 2008 was 2.6 million tonnes. Growing areas have continued to expand westward over the last three millennium. Newer growing areas include California, Australia and Chile. As a note, France’s production is small on a global scale. There are literally thousands of types of olives; in Italy about 300 varieties have been enumerated. However, in reality many are not grown in significant quantities. Generally speaking, olive trees are very hardy, they prefer drought-like conditions, and can live for a very long time. The root system can even regenerate if the tree is damaged above ground. As the trees age, the trunks get gnarled and broader. The trees can be centuries old, there is a tree in Portugal that has been carbon dated at more that 2000 years old. The olive tree sprouts a tiny white flower in springtime. The fruit forms in the summer and ripens between September and November depending on the climate and the weather that particular year. 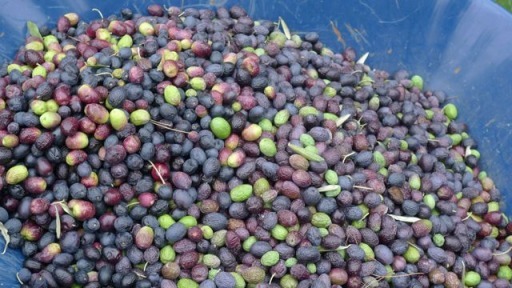 In more southern climates, the olives are left to turn ripen on the tress and fall to the ground onto tarps and may even be shaken loose to harvest. Provence is considered a more northerly production area; the trees are typically pruned annually to keep them small as the mostly green olives are handpicked. Olives in their natural state are bitter and hard. As such there are several ways to process olives for eating, some more natural than others. The traditional process involves a water washing process to eliminate the bitter carbohydrate followed by fermentation with natural flora. The fermentation process can be as short as a couple weeks or as long as several months. The process involves soaking the olives in combination of water, salt and vinegar. Additional flavourings and spices can be added as well, by soaking in marinades. Ginger and Nutmeg had the good fortune to be invited to help some friends harvest their 2010 crop. The day was particularly bone chilling, so we were all quite bundled up. The olives are literally handpicked off the tree, so with a little activity and some good conversation we all warmed up and finished picking the olives in their grove. This was a lean year as they weighed in the crop at the village “Moulin a Huile” at 21kg, last year they had 100kg. By this time they have received their share (-10%) of the olive oil equivalent of their crop in large plastic jugs. Despite the cold it was a great day. Ginger was particularly keen to pick every last olive. We had a tour of the “Moulin”, and best of all we had a fabulous seafood risotto lunch with our new friends.